Payment Gateway. ACH Payment Gateway Services. Payment Gateway Providers. Payment Gateway Company. Batch transmission transmits the complete bank routing number, bank account number and the name of the account holder. While sFTP is a secure method of transmitting files, the fact remains that the sensitive data is stored somewhere within your organization’s IT infrastructure, thus potentially exposed to being compromised by outside operators. Moreover, employees come and go, and who’s to say that one single disgruntled employee might walk away with that data. An ACH payment gateway can eliminate these risks. The ACH payment gateway receives an initial customer record that includes the bank account data and then posts back a reference token to be stored by the software application, removing the sensitive data. Therefore, no sensitive data need ever be stored on the organization’s IT infrastructure. Subsequent ACH transactions are posted using the stored reference token instead of the sensitive data. The sensitive data is stored in a PCI level one compliant system. Currently there is no requirement for ACH transactions to be subject to PCI requirements like credit card transactions, but there should be. ACH and credit card data both amount to financial loss if sensitive data is compromised. Why there isn’t such a requirement is most likely because mandating such a requirement would mean a lot of work for tier two and tier three financial institutions that don’t have the IT capabilities of the tier one financial institutions like Bank of America, Chase, Wells Fargo, etc. 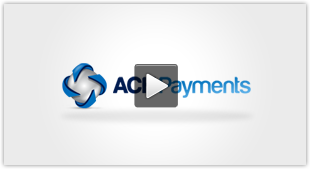 API integration with the ACH payment gateway can automate a number of transactional tasks. Applications having a subscription component, or recurring transactions, are common users of ACH processing for a variety of reasons. The ACH gateway API can automate the origination of these recurring transactions for a set it and forget it senario. Doing so greatly reduces manual time involved in creating a file such as in a batch submission senario. This automation can be left to be managed by the ACH gateway API, as it has objects for schedules and schedule_items. Using those objects pushes the recurring transaction tasks off to the ACH gateway to manage, yet the ability to change a schedule or modify amounts, including for single transactions remains. While some development teams do rely on the ACH gateway’s schedule objects to manage their recurring transactions, some opt to programmatically manage that functionality within their application itself. This, too, can be accomplished via the gateway API. Use cases generally point to one direction or the other. A number of notifications can be triggered via the ACH payment gateway integration, including internal notifications, organization notifications and settlement notifications. For example, an origination notification might instantly return back an invalid TRN notification letting an application user know that the TRN is invalid. A settlement notification can be returned letting accounting know that a transaction has been considered settled, thus posted to their account. Another use for settlement notifications would be to let internal personnel know it’s okay to ship goods. Likewise, late returns and chargebacks can be configured for notifications and allow for internal personnel to track transactions that consumers dispute. Verification services can be called to assist a merchant with risk mitigation on ACH transactions. Options range from simple TRN validation and negative database checks to real-time inquiries into account status that allows the merchant user to know if an account is open or closed and has a positive or negative balance. Some applications require additional verification information like account balance. Account balance is possible, but currently it requires a consumer provide account login credentials to the financial institution’s online system. Authentication of bank accounts is also possible and provides merchants with the ability to know that the person presenting bank account credentials actually owns that account, matching name or business name with the bank account credentials. Many SaaS applications are built to serve multiple businesses, and they want as few choke points as possible for user adoption. The ACH Payments Gateway API can provide a white label experience to the merchant users when applying for ACH processing services. The API allows the SaaS application to embed the application process within their website or mobile app, transmitting the application data to our underwriting team for approval. Many applications leave it to their user base to create API keys from our web portal and enter the keys themselves for activation. However, using the merchant application API this process can enable functionality for the enrollment team and its process to automate a credential push to the SaaS team for entering API keys on their end. Generally, the use case determines the proper method for the organization and its users. While there are some applications that solely use ACH transactions as their method for payment acceptance, credit cards aren’t going away anytime soon. Credit cards are still the most widely used payment modal for remote transactions, and to dismiss the need for them would seem silly. It would also be silly to have to integrate to multiple gateway API’s to facilitate both payment modals, assuming a single gateway can facilitate both. For that we have the answer. While we started out some 19 years ago in the ACH space, we quickly enhanced our offerings to include credit card processing. We can provide you a single gateway integration that covers both the ACH and credit card payment modals. ACH Payments has been providing ACH gateway integrations to organizations of all sizes for 19 years. Contact us to discuss your integration needs and let us help you find the right mix of tools and services to meet your needs. Integration of an ACH payment gateway provides the ability for a software platform to embed payments functionality into their platform. The ACH payment rail is especially ideal for applications having a recurring payments component, but not necessarily limited to recurring. The ACH rail can also be extremely beneficial for disbursements to partners, vendors – or even for internal use, e.g., payroll. Integration by a software platform also can provide an additional revenue stream to the integrating organization, and while still providing as good or better than current market rates. One of the major benefits of ACH gateway integration is the reduced costs associated with the ACH payment rail. Unlike credit card transactions, we charge no discount fee for transactions originated by credit-worthy organizations. If your application serves a vertical base of low risk clients, providing an ACH payment gateway integration will provide your client base with a value add service that can save them up to 90% in processing costs. The ACH Payment Gateway has the ability to be utilized by other third party processors or financial institutions. Capabilities can include risk mitigation tools like transaction limits and velocity settings, both with notification functionality as well as dashboard views. Merchants can be boarded via API. Merchant processing origination capabilities include the same as we provide, but in a white label environment. Typically an minimum number of monthly transactions are required. However, for newer organizations a setup fee can offset minimums. Multiple configurations are possible for third-party use. It’s mandatory to have an initial requirements discussion to go over your organization’s needs in order to arrive at costs. Please contact us.